SHF #10: Fresh Cheese and Honey Tartlets - Do You Know The Muffin Man? This is my first contribution to Sugar High Fridays, an online food blogging event. SHF #10 is hosted by Nic at bakingsheet and the theme is honey. After searching through my baking books, I decided on Fresh Cheese and Honey Tartlets from The Foods of the Greek Islands: Cooking and Culture at the Crossroads of the Mediterranean by Aglaia Kremezi. What sounded intriguing was that the pastry was made using oil and beer, while the filling featured a blend of ricotta and honey. I used eucalyptus honey I bought at a health store, something I've never tried before. I can't say that I taste anything distinctive about it, I'll have to compare it side by side with some other honeys. A stroll through the LCBO yesterday led to an unexpected find: Floris Honey, a Belgian wheat beer from Brouwerij Huyghe made with 15% honey! I used a very smooth ricotta so there wasn't any liquid to drain when I put it in a cheesecloth-lined colander overnight. Since it was already processed, I omitted blending the filling in a food processor and just mixed everything by hand. The dough was quite oily and difficult to shape. The recipe says to put a spoonful of filling in the centre and then form the tarts, but I found it much easier to do the opposite. Pressing towards the base while pinching down on the bottom helped it to keep its shape, but the dough didn't stick together very well. I was afraid they would all spread out in the oven. As you can see, the tarts aren't very spectacular to look at but they're pretty tasty. The shells are very flaky with a subtle sweetness from the flavoured beer. 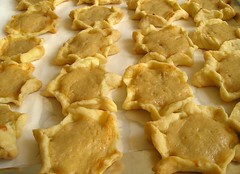 The filling has a bit of spice from cinnamon, creaminess from the cheese and a perfumy aroma from the honey. According to the cookbook, this tart also goes by the Greek names myzithropitakia, lihnarakia or melitinia. If you can't find a copy of the book, Epicurious has reprinted the recipe here.